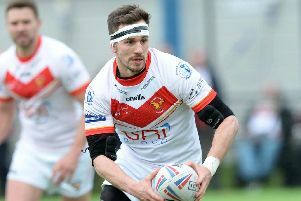 Sheffield Eagles have been hit with a fresh delay as they await a decision on their planned move back into the city for 2018. The club want to have a home at the Lower Don Valley’s Olympic Legacy Park, but there seems to be competition between their prospective investor and a rival business for the rights to develop the site and the structure of the ground. A decision on who will get the go ahead was expected this month, but according to club chairman Chris Noble, that has now been pushed back to August 7. The delay could again leave the club without a base in the city for yet another season, with time against them to build the OLP to minimum RFL standards. Provided they can find somewhere to play, Eagles will be able to survive financially. But the club want the rights to develop the stadium to give them valuable income, and avoid a situation where they are again in a tenancy situation. “At the moment there is nowhere in Sheffield that will allow us to play a full season there,” he added. “We need help, at the very least we need the decision quick, so at least we know where we stand. “We are aware that the Sheffield Eagles want to secure their long term playing future on the 3G pitch at the Olympic Legacy Park Sheffield. Richard Caborn, chairman of Legacy Park Ltd. said: “We are aware that the Sheffield Eagles want to secure their long-term playing future on the 3G pitch at the Olympic Legacy Park Sheffield. “We have received and are considering proposals from potential investors. Following last week’s board meeting, we have decided to do some further work associated with these submissions.